In September, James Nelstrop - founder of the English Whisky Company sadly passed away. 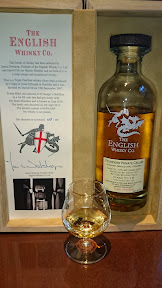 Myself and a friend, having visited the St George's distillery several times to great enjoyment, decided that we would mark his passing by each opening a treasured whisky. My friend selected the Chapter 7 - a rum cask - and I selected their Founder's Private Cellar Triple Distilled. Due to schedules not meshing, it was unfortunate that the next suitable time for us wasn't until the start of November, but that allowed us to pass the word amongst our friends who had visited the distillery with us, to make it a proper celebration. Butterscotch, toffee and a little kiwi fruit on the nose. The body is heavier than expected, with more toffee and a satisfying rum sweetness that's not dominant - no overtones of molasses here, just well integrated flavours. The finish is butterscotch and a touch of fudge. After water (which whorls nice and tightly, if not for long) the nose has gained a little hint of green apple. The body still has toffee and butterscotch, but has gained a little hint of brown bread (crust?) at the back of the palette. The finish is lighter, sweeter - more hints of the fruit. It takes quite a bit of water, or a lot of standing - and it mellows well with either. Continual change towards ever more sweetness. Highly addictive! When would you drink it? If you need a reason, then you haven't understood this dram. Try again, maybe? After such an excellent dram, it's daunting to move on. Will the next dram be as good? My friend's Rum Cask was superb, so it was with some trepidation that I opened my bottle of the Founder's Private Cellar Triple Distilled. 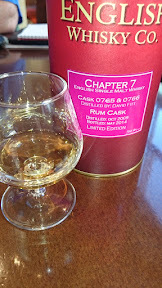 I'd never actually tasted it, but had high hopes it would equal the quality of the Chapter 7. The nose is butterscotch and fudge, with a touch of soft caramel underneath. There's also a tiny hint of plum, which was surprising. The body is light, and very well balanced. Toffee notes join the butterscotch, as does some vanilla. The finish is high quality vanilla ice-cream and soft toffee. After water (which creates tight, short whorls that are delightful and very compact - almost no spreading into the dram), the nose has become lighter and sweeter - a softer nose, with a subtle underlying currant note. The body is a little fuller - more toffee, more vanilla, more fudge, less butterscotch. The finish is longer, sweeter, with a balance of toffee and cracked vanilla kernels. This whisky continues to take water (or stand), and rewards the drinker with light fruits - lychee, melon - as it develops. Like satin falling over the curve of a desire, it's a long moment rather than a snapshot of time. A brilliant dram that shows how elegant a triple distillation can be, and boggles the mind when you consider that it's just 5 years old. When would you drink it? Wrong way round - this dram is the event, not the drink to accompany it. In the end, about ten people tried these two drams, and none could find a fault. A fine legacy for James Nelstrop to leave us all.